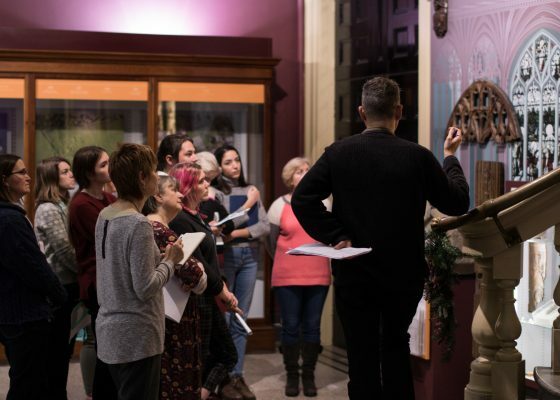 Citizen Curators is a work-based training programme in museum awareness and modern curatorial practice aimed at volunteers from our community. It can also benefit museum staff who want to learn new approaches to museum work. A direct investment in capacity building, workforce skills and diversity by Cornwall Museums Partnership with support from the Esmée Fairbairn Collections Fund. Delivered by Dr Tehmina Goskar FMA of the Curatorial Research Centre. The Citizen Curators course is based on supporting participants grow their confidence and competence in five key areas of curatorial work. Using a coaching-style of teaching, based on Kolb’s experiential learning cycle, the programme participants will self and peer-assess the change they experience through the 6-month programme, supporting each other in their learning groups (5 per museum, per year). By learning through doing, each cohort and group will be able to provide invaluable feedback to their museum in areas of the collection that have been obscured or new ideas and stories that have been discovered. Participants learn how to turn one-way conversations into two-way conversations leading to new content, new knowledge and new relationships which the museum will be able to harness in its audience-focused programming. We’ve put together our top FAQs about the programme. Get in touch with us via our Contact page to find out more.